Mit der integrierten Fernbedienung können Sie die Lautstärke über den Lautstärkeregler am Kopfhörerkabel regeln. Das Produkt verfügt über einen eleganten und luxuriösen Lederüberzug. 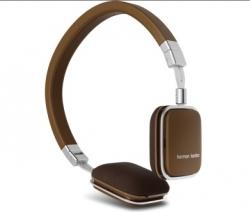 Harman Kardon Soho sets new standards for headphone technology, stylish design and forward-thinking functionality for a beautiful sound that travels with you. The Harman Kardon Soho announces the future of tomorrow’s on-ear headphones – as defined by their exceptional sound quality, eye-opening, sophisticated design and sleek finish. Esthetically impressive, Harman Kardon Sohos open your ears to exceptional sound from specially-selected 30mm drivers and high performance neo-transducers for crisp high ends and a refined bass response. Stylishly crafted from stitched leather and stainless steel, Harman Kardon Soho’s bold headband construction folds inward as its ear cups fold flat, for ease of fitting them into their ultra-slim carrying case – complete with cable management system – ideal for today’s busy on-the-go lifestyle. An inline remote control and microphone make the Harman Kardon Soho simple to use and impossible to put down, whether playing mp3s or listening through iOS or androids. In keeping with Harman Kardon’s long-standing heritage of refinement and smartly engineered design, the Harman Kardon Soho makes the perfect statement as it incorporates many innovative enhancements, transforming them into your ultimate travel companion on a most personal level.